Bellevue Hill is an affluent harbourside eastern suburb of Sydney, in the state of New South Wales, Australia, located 5 kilometres east of the Sydney central business district, in the Municipality of Woollahra. 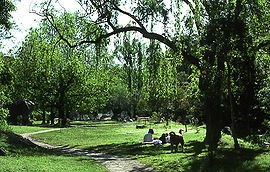 The suburb is located within the Division of Wentworth electorate, which is the wealthiest in Australia, despite being the second smallest. The suburb has long been home to Australia's most notable billionaires. In 2018, Bellevue Hill was found to be the most expensive suburb in Australia, with the highest median house price of $5.4 million. In the early 19th century, Irish-Australian immigrants referred to the area as Vinegar Hill, after the Battle of Vinegar Hill, an engagement during the 1798 uprising of the United Irishmen in south-east Ireland. Governor Lachlan Macquarie took great exception to this and decided to name the suburb Bellevue Hill, the belle vue meaning beautiful view. Later in that century, Bellevue Hill became the home of the Fairfax family, who lived at Trahlee, in Ginahgulla Road, which was leased by James Fairfax from 1866 to 1878. They then moved to Ginahgulla (now known as Fairfax House and owned by The Scots College) in the same road. The Fairfax family were responsible for establishing the Fairfax Media empire, which became a major force in the Australian news media (see also John Fairfax). The line to Bellevue Hill opened in 1909. Services operated from Circular Quay via Elizabeth Street and Park Street. Trams heading south from Circular Quay down Elizabeth Street swung left into Park Street, via a right turn into Yurong Street, a left turn into Stanley Street, a right turn into Bourke Street, then a left turn into Burton Street. A feature was the tram only viaduct over Barcom Ave and Boundary Street in Darlinghurst as the line headed into MacDonald Street. This viaduct is now a road bridge. The line then twisted down Glenmore, Gurner and Hargreave Streets in Paddington, then Moncur and Queen Streets in Woollahra. Here, a connection to Oxford Street allowed access to the Waverley Depot. The line then travelled down Edgecliff and Victoria Roads, then wound along Birriga Road in Bellevue Hill, finally running down Curlewis Street in Bondi to join the Bondi Beach via Bondi Junction line on Campbell Parade, to the North Bondi terminus. The line was double track throughout with numerous points to allow short working. The line was cut back to Ocean Street, Woollahra in 1955; the remainder closed on 27 June 1959. The line followed approximately the current route of bus 389 between the city and Woollahra and route X84 between Woollahra and Bondi Beach. According to the 2011 census of Population, there were 10,765 residents in Bellevue Hill. 56.3% of residents were born in Australia. The most common other countries of birth were England 5.1%, South Africa 4.7% and New Zealand 2.4%. 73.9% of residents spoke only English at home. Other languages spoken at home included Hebrew 1.3%, Cantonese 1.3% and Mandarin 1.1%. The most common responses for religious affiliation were Judaism 23.0%, No Religion 19.2% and Catholic 16.7%. The most common occupations for residents were Professionals 41.9%, Managers 20.7% and Clerical and Administrative Workers 12.8%. In the 2016 census, 10,716 residents were counted. 58.2% of these had been born in Australia. The most common other countries of birth were England 5.8%, South Africa 4.9%, New Zealand 2.2%, China 1.6% and United States of America 1.2%. 74.8% of residents spoke only English at home. Other languages spoken at home included Hebrew 1.8%, Mandarin 1.7%, Russian 1.3%, Portuguese 1.2% and French 1.2%. The most common responses for religious affiliation were No Religion 28.1%, Judaism 21.4% and Catholic 16.8%. The most common occupationsincluded Professionals 40.8%, Managers 22.3%, Clerical and Administrative Workers 11.4%, Sales Workers 7.9%, and Community and Personal Service Workers 7.2%. 4.2% of employed people in Bellevue Hill worked in Legal Services. Other major industries of employment included Other Auxiliary Finance and Investment Services 3.0%, Banking 2.9%, General Practice Medical Services 2.8% and Real Estate Services 2.6%. Bellevue Hill is well known for having some of the most significant real estate in Australia. The Rona Estate, located on Ginahgulla Road, sold for close to $60 million in 2018, making it one of Australia's most expensive homes. The historic Queen Anne home Caerleon was sold for $22 million in January 2008. This price was surpassed by the $23 million paid for a mansion in Victoria Road in November 2009. The mansion had previously been used by the French consulate since 1955. One person who inspected it was actor Russell Crowe, who subsequently did not take part in the bidding. The house was bought by Lachlan Murdoch. Actress Toni Collette sold her Bellevue Hill home in August 2009 for $6.4 million. The house, El Mio, had been the base for Collette and her husband, musician David Galafassi, since they bought it in 2004 for $5 million. The house was located in Rupertswood Avenue and was designed in 1928 in the Spanish Mission style. It was initially passed in at $6.3 million, but was then sold within an hour after successful negotiations with the highest bidder. The following buildings are on the (now defunct) Register of the National Estate. Bellevue Hill has several schools, including Bellevue Hill Public School and private schools The Scots College and Cranbrook School. Kerry Packer, a businessman who was Australia's richest man at the time of his death in December 2005, lived at Cairnton on Victoria Road. James Packer, son of Kerry Packer and a businessman who was Australia's richest man from 2006-2008. Tony Hancock, comedian. Found dead after an overdose in his flat. Edmund Capon, the former director of the Art Gallery of New South Wales, lived in Bellevue Hill. Rene Rivkin, the late stockbroker, lived at Carrara, 5 Rose Bay Avenue, Bellevue Hill. He later moved to Point Piper. Charles Blackburn, a former chancellor of the University of Sydney. Died at his home in Bellevue Hill. Alan Kippax, the former Australian Test cricketer and captain of New South Wales. Lived in Bellevue Hill for many years, and died at his home in 1972. Sir William McMahon and Lady McMahon, Prime Minister of Australia and wife lived in Drumalbyn Road And Victoria Road respectively. David Wilson KC, lived at Yandooya, Cranbrook Road, from 1919 until 1943. This house was built in 1912 to a design by the architectural firm of Manson and Pickering and had extensive grounds running between Cranbrook Road and Cranbrook Lane. The Scots College bought the property in 1943 and it became a boarding facility, Royle House, but was demolished in 1981. Sanjeev Gupta, British-Indian billionaire, and founder of Liberty House Group. Since 1908, Bellevue Hill has been represented in one of Australia's most popular sporting competitions, the National Rugby League, by the Sydney Roosters, officially known as the Eastern Suburbs District Rugby League Football Club. ^ a b Australian Bureau of Statistics (27 June 2017). "Bellevue Hill (State Suburb)". 2016 Census QuickStats. Retrieved 27 January 2018. ^ Australian Bureau of Statistics (31 October 2012). "Bellevue Hill (State Suburb)". 2011 Census QuickStats. Retrieved 1 May 2015. ^ "Leura". New South Wales State Heritage Register. Office of Environment and Heritage. H00047. Retrieved 18 May 2018. ^ Significant Buildings – Yandooya[permanent dead link]. Retrieved 22 August. ^ "Ex-Eagle Chad Fletcher escapes conviction on cocaine charge". WA Today. 15 December 2010. Retrieved 1 August 2015.